Soccer has officially arrived here at Salt Lake Community College. SLCC soccer has been organized at the club level for the past several years. That will change this fall after the school announced in March that men’s and women’s soccer will be added to the athletics program. The soccer teams will compete in the Scenic West Athletic Conference and be eligible for NJCAA tournament play. Dustin has been working with the administrative board and other athletic directors to get soccer approved. According to Dustin, the current list of SWAC schools that have committed to play within the next two years include SLCC, College of Southern Nevada, Snow College, College of Southern Idaho, CNCC and USU-Eastern. The teams will play on the west lawn of the Taylorsville Redwood Campus for the first year. The matches will be free and open to the community. The idea is to have the men and women play back-to-back games to draw more fans and raise awareness for SLCC soccer. Dustin says that they may look at other long-term agreements about a different location, but for now those types of decisions take time to figure out. Funding for the soccer teams will come from an unspecified raise in the athletic fee that every SLCC student pays in their student fees. 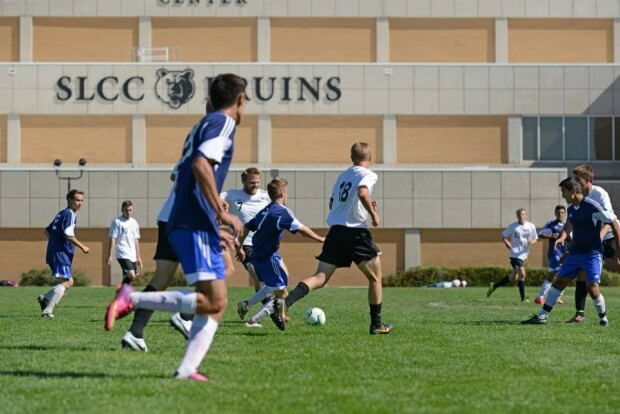 Now that they know who — and where — the soccer teams will play next season, SLCC will focus on building the actual teams. Dustin is currently conducting a nationwide search for a head coach; the recruiting process will begin after the coaching staff is assembled. Players must be full-time SLCC students and meet academic requirements that are consistent with the other sports. A limited amount of scholarships will be offered to those who make the team; the number of scholarships will increase in upcoming years. An open tryout will also be held at a later date to add more players. None of the soccer club players have a guaranteed roster spot. The tryout will be open to all students who want to make history as a member of the first Bruin soccer team. Students interested in trying out for the team and other soccer updates can visit the SLCC Athletics website for more information.